It is not easy apprenticing under the bear-like Kumatetsu, but at least the human boy Ren will not have to deal with a lot of brooms or pails of water. Cleaning up is not a high priority for his slovenly master. Kumatetsu is a fierce fighter but he cuts a shabby figure in the beastly realm of Jutengai. 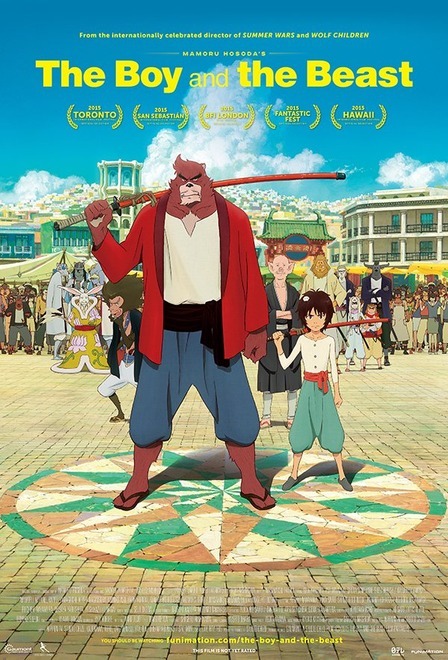 Naturally, the two outcasts will eventually start learning from each other, but there will be no easy shortcuts taken in Mamoru Hosoda’s original anime feature The Boy and the Beast (trailer here), which opens this Friday in New York. Ren would rather live as a runaway on the streets of Tokyo rather than endure his late mother’s odious relatives, who legally denied his father any custody right because that is the sort of thing they do. Fortunately (probably), Ren catches the eye of Kumatetsu not long after he starts living rough. The moody warrior often comes to distract himself in the human world with his snarky chimp-like crony Tatara. Seeing some fire in Ren’s eye, Kumatetsu half-jokingly offers to make the human his apprentice. Of course, training humans is strictly forbidden in Jutengai, but when Ren inadvertently follows them into the animal dimension, they are sort of forced to accept the arrangement. Arguably, Kumatetsu needs Kyuta (as he rechristens Ren) as much as the human needs him. The blustery warrior plans to challenge the vastly more popular Iozen to succeed Jutengai’s ruler Soshi, but no disciples have ever put up with the beastly beast’s raging temper for more than a day—until Kyuta came along. They will work for their breakthroughs the hard way, but they will have the wise counsel of the pig-like monk Hyakushubo and the bafflingly indulgent Soshi. At some point Kumatetsu will face off against Iozen, but the latter’s mysteriously sinister son Ichirohiko will be a dangerous wild card, targeting Kyuta and his master, without regard for honor or custom. Boy and the Beast might be anime, but it is still probably the best coming of age film you will see all year. It covers approximately ten years of Ren/Kyuta’s life, during which time he will come to terms with his relationships with Kumatetsu and his human father, while also haltingly courting the scholarly human cutie, Kaede. Honestly, there are some real emotional kickers in the film. There’s also a tractor-trailer load of fighting, all of which Hosoda renders with great gusto. 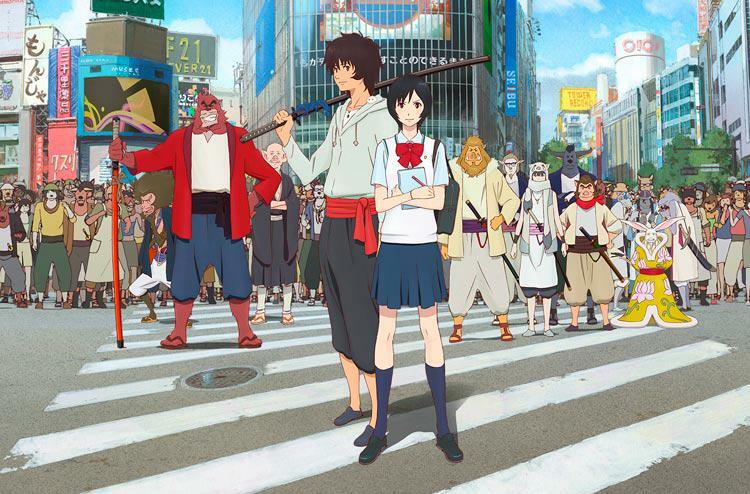 Granted, the anamorphic tradition in anime is long and sometimes distinguished, but with Jutengai, Hosoda engages in some rich and wide-ranging world-building. He also creates an extensive cast of well-developed supporting characters. Hyakushubo has some particularly memorable moments (appealingly voiced for the English dub by Alex Organ). It definitely goes for the heartstrings down the stretch, but there is nothing cheap about the film’s sentiment. Hosoda earns it fair and square. Highly recommended for all animation fans and those who enjoy genre tales set where science fiction and fantasy overlap, The Boy and the Beast opens this Friday (3/4) in New York, at the Angelika Film Center and the AMC Empire.